A school has cancelled a talk by an editor at the US right-wing website Breitbart who was banned from Twitter in a racism row. 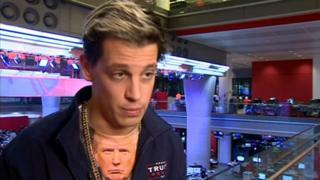 Milo Yiannopoulos had been invited to speak at his former school, Simon Langton Grammar School for Boys in Canterbury, on Tuesday. The decision was taken after the school spoke to the Department for Education Counter Extremism Unit. The school said pupils and parents had been in favour of the talk going ahead. Milo Yiannopoulos previously said people who were offended by his views did not have the right to prevent them being heard. The former pupil had been invited by the Langton Liberal Arts Society to give a talk on politics, the alt-right and the recent US election. Earlier he posted on Facebook: "My old high school has been bullied into canceling [sic] my talk on Tuesday by the "counter-extremism" unit at the U.K. Department of Education. "Who even knew the DoE had a counter-extremism unit? And that it wasn't set up to combat terrorism but rather to punish gays with the wrong opinions? Perhaps if I'd called the speech "MUSLIMS ARE AWESOME!" they'd have left us alone. Disgusted." James Soderholm, professor of humanities at the school, said the decision had been taken because of the threat of demonstrations by organised groups and concerns over the security of the school and the safety of pupils. He said: "Within 24 hours of advertising the event, 220 Langton sixth formers had, with parental consent, signed up for the event. "Objection to our hosting Mr Yiannopoulus came almost entirely from people with no direct connection to The Langton," he said. "The staff and students of the school were overwhelmingly in favour." Christine Dickinson, Kent secretary of the National Union of Teachers, said she would have preferred another speaker to also be on stage with Mr Yiannopoulus to challenge his views. Mr Yiannopoulos's account was shut down by Twitter in July for comments directed at Ghostbusters' actress Leslie Jones. Breitbart News, which has been accused by some as being a hate site, is the most-read conservative news website in the US and makes no secret of its close links to US President-elect Donald Trump.